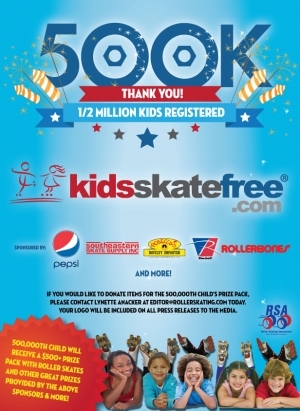 (Indianapolis, IN) June 18, 2015 – The Roller Skating Association International, the official voice of the roller skating industry, is thrilled to announce that in just three months since acquiring Kids Skate Free, a milestone record has been reached – 1/2 million kids have now registered to receive two free roller skating passes weekly for their participating home rink. To celebrate this milestone, the 500,000th child registered, Cobey Greer who was registered by his mom at Skatin’ Station in Canton, Michigan, will be receiving a prize pack valued at more than $500, which will include roller skates and other incredible prizes donated by Pepsi, Southeastern Skate Supply, Rebecca’s Toys and Novelties, Riedell Skates, Rollerbones and more. 2x safer than school playground equipment, 3x safer than football and baseball, 4x safer than basketball, 5x safer than riding a bike. There are 400% more injuries playing basketball versus roller skating. Parents who wish to participate may visit www.kidsskatefree.com and click on their state to begin finding their participating roller skating rink and register to receive free passes. If your local roller skating rink does not participate in the program, the RSA encourages parents to notify their rink that they would like them to participate by downloading the letter available at www.kidsskatefree.com and providing to their local rink. As the voice of the roller skating industry, we strive to promote the success of our members by providing education, professional resource tools, and fostering the advancement of roller skating. Sources: American Heart Association, Consumer Product Safety Commission, and studies done by the Human Performance Laboratory - St. Cloud State University in Minnesota, University of Wisconsin Medical School, and the University of Massachusetts.